David Cameron has proved his political ineptitude by allowing David Laws to be thrown to the wolves. Laws was a key figure in his government, yet Cameron refused to back him and allowed the media to pick him off. Cameron enjoyed a potential position of strength in these early days of his new government, yet he squandered it by refusing to support one of his most important ministers. God knows what Nick Clegg thinks he was doing allowing this to happen. By allowing a spurious and intrusive Telegraph story to destroy the career of such an able politician, Cameron has given the green light to the media to pick off his ministers as they see fit. In doing so, he has declared his own insubstantial weakness. Today is a sorry day for politics. And Cameron (with Clegg in a minor supporting role) must accept responsibility. Had David Laws taken out a joint mortgage on this or a more expensive property instead of paying rent to his partner, he could have claimed the full allowance and nobody would have complained. After all, many MPs did that and built property portfolios. Of course, the taxpayer would have been worse off. So forgive me if I don't get all sanctimonious about David Laws or pleased to see the Telegraph gleefully outing him. But other ministers will note that David Cameron seems happy to hang him out to dry despite his clear value to the coalition. Ministers who expect mutual loyalty in future should beware. Greater independence for schools, a pupil premium and more free schools are good ideas in principle. But the coalition has made a fundamental error in its decision not to place a requirement on the new outstanding academies to work with other schools, or support wider improvements through teacher training or subject leadership, something that it a requirement of the specialist schools programme at the moment, particularly for high performers. Michael Gove has said that he hopes that this will happen - and that it will be required in business plans for other schools becoming academies - but it will not be a condition for the very best schools. Ministers seem to be confusing bureaucracy and leverage. There has certainly been too much of the former, but there is an optimal amount of the latter that you give away at your peril. The Conservatives were critical of Labour for lifting GPs' salaries while reducing requirements for out-of-hours cover. Yet, here the coalition is handing over one of the strongest levers they have without any expectation that the new academies work to help improve the wider system. Many outstanding school leaders already do an excellent job through programmes like the National Leaders of Education or High Performing Specialist Schools. But there should be an expectation in their funding agreement and trust charter that any outstanding academy actively works to help improve other schools. Unless admissions policies change radically, this cannot happen simply through the pupil premium. So it requires the best to work with other schools. And given that Michael Gove has said that one of his key aims is to narrow the gap between rich and poor pupils, it is a pity that he has missed a golden opportunity to link such greater fairness explicitly to greater freedoms. Many of the planned cuts in today's package from George Osborne are entirely predictable, and probably understandable given the decision to cut public spending further this year. But the decision completely to scrap child trust funds is a serious and retrograde mistake. Encouraging poorer families to save for their children's futures ought to be a key objective of any administration; supporting social mobility by giving people a chance to acquire assets can be as important as a decent education. In the most deprived areas, the default accounts set up for our children's future was the one hope that those doomed to intergenerational disadvantage might emerge at 18 with at least some chance of a deposit on a home, an opportunity to take advantage of higher education or the beginning of self-employment. I should simply say that this is an example of the Lib Dems making a Tory policy worse. The Tories proposed to retain Child Trust Funds for the bottom third of families by income (Which would roughly mean for any family with a pre tax Credits income of c£15,000) That’s bad, because the 15k/16k mark is well below the point at which financial capital is needed for children, but at least it’s something. Progressive Alliance types? This one is on you. Education Secretary Michael Gove plans a speedy introduction for the new Con-Lib coalition's two most radical school reforms: a pupil premium giving schools extra money for disadvantaged pupils, and the expansion of academies. At the same time, he wants to raise standards in exams, scrap targets and improve accountability. The pupil premium and "free schools" plans are both good ideas. Indeed, Mr Gove freely admits drawing on Tony Blair's school reform plans. But unless he gets the details and the levers right, he won't achieve the improved standards and fairer funding he hopes to deliver. Mr Gove wants outstanding schools to become academies as a right. This appeals to many former grant-maintained schools, as their funding would come from central rather than local government. Second, he wants any schools failing for more than a year to be closed and replaced by academies, echoing Labour's approach. And third, he wants parents, teachers and charities to promote new "free schools" similar to the Swedish model. But the policy details matter as much as their radical intent. Former schools secretary Ed Balls made two excellent schools into academies - Outwood Grange College in Wakefield and Greensward School in Essex. In return, they established trusts to help weaker schools to improve. Mr Gove should use this model as a lever to gain more improvement by making the most of our best heads. That way he can link greater freedoms with higher standards. With free schools, he faces different problems. Some parents' and teachers' groups will be attracted to working with education providers to develop free schools. But the policy could prove just as attractive to unviable small schools threatened with closure and to controversial faith groups. A schools commissioner - a post Mr Balls scrapped - is vital to encouraging new promoters, particularly in disadvantaged areas, and to ensuring that any public money spent on building or refurbishing the new schools is not wasted. In the absence of for-profit schools - a crucial element in Sweden - it is taxpayers, not the providers, that fund the risk. And there are some levers that Mr Gove may be tempted to ignore, but would be unwise to. I'm all for a bureaucracy bonfire: most Treasury-driven targets were counterproductive, and Mr Balls exacerbated some. But floor targets have been New Labour's unsung success, and Mr Balls rightly extended them. These are minimum standards, such as the expectation that all schools achieve five good GCSEs for at least 30 per cent of their pupils. They have seen the number of below-target secondary schools fall from 1,600 in 1997 to 247 last year, with similar gains in primaries. Mr Gove might adapt these targets to include science or languages but he shouldn't lose them completely. The pupil premium was presented as a Liberal Democrat victory in the coalition negotiations. In truth, it was favoured by all three parties. The big difference was that the Lib Dems had put a £2.5 billion price tag on its delivery. By contrast, the Conservatives had hoped to deliver the premium through savings elsewhere and they saw it as a lever to encourage good schools to recruit poorer pupils. The Institute for Fiscal Studies says the Lib Dem version could provide schools with an extra £2,400 for each pupil in receipt of free school meals. However, the existing system also provides substantial extra resources for these pupils, amounting to far more on average. But it is concentrated in areas with the greatest disadvantage, whereas the coalition proposals would fund poorer pupils in leafier shires and suburbs as well. So the Treasury will surely demand a rationalisation of existing funding before introducing the premium. However, this could create plenty of noisy losers as well as quietly grateful winners, as schools rely on pots like the Standards Fund to support the curriculum and staff posts. Charles Clarke experienced this problem when he tried to reform school funding as education secretary. Schools will need to be given additional grants to compensate for increases in inflation, so their baseline budget doesn't fall in real terms. Otherwise there really will be frontline cuts. Both flagship policies are supposed to increase social mobility. But if schools aren't open to poorer pupils, this is hard to achieve. Mr Gove supports a non-selective admissions code, but opposes measures that would genuinely open schools to all. Unless good schools, including the new academies, open a significant number of places to all applicants, using either academic banding or random allocation, the reforms will do nothing for social mobility. Most admissions will continue to be based on siblings and the ability to afford nearby houses. The coalition may not want to force the issue, but it should encourage open admissions through its funding agreements. Finally, Mr Gove wants to tighten exam standards. He can do so with three simple steps: a single exam board for England, to stop schools shopping around; a big cut in modularity in GCSEs and A-levels, with more marks for final exams; and a reduction in repeats. However, he should be careful to avoid adding complexity to accountability like Mr Balls' report cards. Mr Gove should also be wary of changing the timing of primary school tests or fiddling with the league tables. By adding English and maths to the five GCSE benchmark, Labour has created a relatively robust measure. More data should be published, but the Government shouldn't obscure data that most people can understand - or that allow its record to be judged. Get these things right, and the pupil premium and free schools can make a real difference. Get them wrong and coalition ministers will be desperately seeking new initiatives a few years down the line - and wondering why. ....the likelihood of those from the lowest participation areas participating in HE has increased by 30 per cent over the last five years alone and by 50 per cent over the last 15 years. Importantly, the gap between the participation rates of the most advantaged and the most disadvantaged areas has been narrowing, both in proportional terms and percentage point terms, since the mid 2000s. This is the first time that this has happened since the mid-1990s, and most likely ever. This significant narrowing of the gap has not occurred at the expense of fewer young people from advantaged areas entering higher education. Young people in advantaged areas are 5 per cent more likely to enter higher education than five years ago, and 15 per cent more likely compared to the mid-1990s. It would therefore be fair to conclude that without these efforts we would have seen a decline in the both the absolute and relative participation rates of such students in the most selective third of institutions. It is important that we draw all the lessons from this report if we are to improve access to elite universities and improve access further to higher education in general. The greatest reform act since 1832. Come off it. David Cameron promised an end to the age of spin. Clearly Deputy PM Nick Clegg wasn't listening. In his hyperbolic speech today he describes his decision to reduce police access to DNA and CCTV, and to settle for the Alternative Vote instead of proportional representation as the "greatest shake-up of democracy since 1832." What ahistorical rot. This is to ignore the changes to the House of Lords after their attempts to usurp the Liberal government in the 1911 Parliament Act. It is to pretend that the extension of the franchise after the Great War with universal suffrage in 1918 and 1928, trebling the electorate, never happened. It is to forget that the last government introduced devolution in Scotland, Wales and Northern Ireland, freedom of information, an end to the hereditary principle in the Lords and proportional representation for many non-Westminster polls. But perhaps this hyperbole is a mere cover for the confusion at the heart of government over civil liberties and the police. For Clegg's speech comes a day after Theresa May rightly imposed control orders on two Al-Qaeda suspects who could not be deported (something the Liberal Democrats would abolish) and on the day that she wants to give 'frontline police officers more discretion' in charging people . So, the police will be able to charge people for minor offences more easily (though, presumably, only if they meet a requisite evidence requirement) but they will be denied access to DNA and CCTV evidence that has been so crucial in not only convicting people recently but also in uncovering miscarriages of justice. And, those of us green enough not to drive cars will still have to produce passports when our ID is demanded, as happens frequently, as we will not even be allowed to buy a government-approved ID card. I feel safer and freer already. Can't they take a joke? was the best of British black humour and hardly something to be treated with the po-faced sanctimony that Laws started which has been echoed in today's press. The truth is that Byrne had laid the groundwork for many of the savings that he publicly recognised would be needed, and that is why the Tories will be able to make speedy announcements on cuts. But the realisation that coalition has turned a rather able Liberal Democrat into a pompous mini-Osborne with American levels of ignorance of irony is nearly as frightening as the level of cuts that he is preparing. We need to begin with why we lost. The essential problem was simple. In a change election we were perceived to be defending the old order. Future is the most important word in politics; but we looked out of time. Understand this, and we can rebuild. Be brutally honest about it: for too many people, we were not the people’s party that was created 100 years ago, but the politicians’ party. We were perceived by too many voters, our people, as out of touch. So why did it happen? Because our challenge after three terms in government was renewal. We all agreed on that. Renewal in policy, renewal in culture, renewal in organisation. But we did not manage to make it real. We needed a renaissance of progressive thinking; people thought we had tried to reboot New Labour. - On policy, we were neither proud enough of our record, humble enough about our mistakes, clear enough about our offer. We saved the NHS but it was not an issue at the election. We lost focus on education and anti social behaviour. We were playing catch up on political reform, immigration and housing. We had many policies which made sense, but they did not convince the electorate we had a coherent vision for the future of the country. - Let’s be honest about culture too and organisation too. We did not symbolise today’s requirement for openness, participation and dialogue. We talked about new politics, late in the day admittedly, but we did not escape the image of politics as a game not a calling. We drew on our deepest strengths come the election. But an electoral machine is only replenished when it is a genuine social and political movement in the community, able to affect change. That is what many of our MPs have taught us. That is what the whole party needs to be geared to achieve. The result is that our conversation with the public broke down. We need to restart it with our most precious asset: our idealism for a better future. Idealism is the lifeblood of our party. Not that we think we will build heaven on earth; but that we should try. And that when we create the NHS or legislate for a minimum wage or deliver free nursery education or triple overseas aid we live out our commitments to the brotherhood of man. The beating heart of progressive values in Britain has not been stilled. In fact the other two main parties spent most of the election trying to steal them from us. What we lost was the sense that the Labour Party could be the vehicle for the implementation of those values. So we have to put that right. Starting with this contest. Starting with one vow more important than any other: we renounce today re-fighting the battles of the past. The Blair/Brown era is over. I am not interested in politics defined as Blairite or Brownite. New Labour isn’t new any more. We learn from it; we benefit from it; we seek to emulate its successes but not repeat its mantras. We need new ideas, and new ways of doing politics. New Labour did fantastic things for the country. But now we are out of power, what counts is next Labour. Listening, idealistic, open, engaged, thoughtful, radical, decisive, Labour. We have four tasks that we must address together. First, we must reconnect our party, its aims, our policies, with our values and our voters. For the mum who works hard and gets tax credits but is fearful about the needles that she finds at her kids’ playground. For the dad who wants to work but whose job went when manufacturing left town. For the teenager who wants to do the right thing but has nowhere safe to go in the evening. I remember the day we committed in government to that inspiring and audacious goal of ending child poverty. It required a massive moral crusade like the Jubilee Debt campaign. Yet what should have been a pulsating movement in every community came to be seen as a technocratic exercise in Whitehall. Politics without values is not just barren; it is unsuccessful. Second, we must renew our ideology and ideas. The best of the last 13 years is transformative. That new parents expect free nursery places and modern schools; that no political party dares to stand against tackling climate change or raising overseas aid or championing gay rights; that the NHS has been saved for future generations. The mistakes have included flinching from political reform; the lack of responsibility at the top of society; the late realisation that the green agenda is not “environmental” but in fact about economics, culture, security. I stand for individual freedom and social justice. The two traditions of progressive politics in Britain. We succeed when we make them partners, as with the National Minimum Wage or legislation on civil partnerships. We must make them partners again. Third, we must renew our party. We won an election on May 1st 1997. Party reform stopped on May 2nd 1997. We did not become a movement in our communities rather than just an electoral machine. There is no one way to do that, but it must be done; we must try all of them. Engaging far far better with those three million trade unionists who choose to pay the political levy in what I believe is a positive act of democratic participation; trying what socialist parties around the world have done with experiments like free party membership to become mass networks; building up the connections with civic society that new media make possible. Movement not just machine should be our watchword. And we must finally be a strong opposition. We are in a unique situation. The Conservatives spent the whole election campaign running against a hung Parliament and they are now in coalition with the people who depend on a hung Parliament for power. Meanwhile the Lib Dems told people to vote for them to keep the Tories out, and ended up bringing the Tories in. So much for new politics. We need to be an opposition which is constructive where possible, and determined, raucus, passionate, obstinate where necessary. These are big tasks. And we may not have much time to do them. So we need to start in this leadership campaign. We say we believe in new politics. Let’s show it. The country will not be looking at us carefully in the next few months, but they will notice us; they will be quietly judging our character; they will not follow the details of what we say but they will notice how we behave. So this campaign needs to be a credit to the party. I propose to run my campaign in the following ways, to bring credit to the party: there will be no negative briefing about other candidates; it’s not my way and I won’t be starting now; the people who work for me will be chosen because they don’t do it either; we will tackle unattributable briefing through my named spokeswoman Lisa Tremble; we will listen to every MP and candidate, whether or not they support me, for their ideas about what the country needs and the public want; they’ve just spent weeks on the doorstep and we need to make the most of that knowledge; we will listen to the country as well as campaign in the party; we will take the party and its ideas out into the constituencies we have lost as well as those we have won; and we will raise money for the party; lets face it – the financial disadvantage we faced at the election was made by error not nature; I will start as I mean to go on, giving at least one third of the funds I raise for this campaign into a fighting fund for the next general election. - the politics of belonging: what the world looks like out of your front window, in the semi detached house or the tower block; how much migration, how much change in housing, the local environment, local amenities. I know the sort of Britain I want to live in. A country where power is redistributed, merit rewarded as well as needs met, global connections celebrated. And I know what sort of Labour Party we need to deliver that Britain: a living breathing movement not just a machine. I'm not a huge fan of adventure films, particularly those of a pseudo-historical bent like Braveheart. So against expectations, I was pleasant surprised by Ridley Scott's Robin Hood which we saw last night. This is a vastly superior, highly intelligent take on the legendary figure placing him in the context of the history of his day. It benefits from a cracking and witty script, great Pembrokeshire scenery and marvellous acting. The grimy filth of peasant life in Nottingham is as well shown as the misery of soldiers returning from the Crusades and the (albeit animated) realities of a sea-based French invasion. Scott spares little of the brutality of medieval war, but the film is as much drama as action, and is all the better for it. Russell Crowe is a great Robin, with Cate Blanchett superb as Maid Marion, but there are plenty of other great actors through the film including Eileen Atkins as the domineering Eleanor of Aquitaine and Matthew MacFadyen as a simpering Sheriff of Nottingham. The film ends before the merry band start life as saintly outlaws, setting up the sequel. A great escape from the week's politics. This post was picked up in the Belfast Telegraph. I wish the new Government well. There are some good policies in the Coalition agreement, some on political reform like PR for the Lords - though not the absurd 55% requirement in a vote of confidence - and on education (if Michael Gove uses the right levers). But one thing is clear: despite all the rantings and ravings of the Tory right, it is the Liberal Democrats that have been the clear losers. Cameron has played a blinder by convincing the world and the Lib Dems that he has had to make huge sacrifices to win this agreement. First, the Lib Dems' power is limited. Nick Clegg as Deputy PM has settled for a desk in the Cabinet Office, but no real job. David Laws has a poisoned chalice implementing the cuts as chief secretary. Vince Cable has been sidelined on banking reform in the business department without the influence of Lord Mandelson. Danny Alexander has Scotland, a non-department. Only Chris Huhne has some influence at energy, but on nuclear power is stymied by his own party's opposition. The Lib Dem junior ministers are unlikely to have much of a role to play in each department, though they may prevent the wilder excesses of right-wing Tory ministers. Bizarrely, the Lib Dems accepted all this in preference to insisting on even one major office of state or spending department like education or health. Second, on policy, as John Rentoul has pointed out, Clegg has been royally outmanoeuvred by Cameron. The pupil premium was Tory policy anyway: Michael Gove will be pleased to have some money for it. The £10,000 tax threshold will mean a middle class tax cut paid for by public sector savings, not a more progressive tax system (though economically a better approach, this is hardly what the Lib Dems wanted). The fixed term parliament suits Cameron as it ties in the Lib Dems. On the abstention votes on tuition fees, marriage tax or nuclear power, the Tories will win anyway with a 307-286 majority. And whether or not an AV referendum succeeds, the Tories will still be able to push through their gerrymander of English constituencies to make more of them Conservative. Cameron will be delighted to neutralise his right-wing, ditch crazy policies like the inheritance tax cut and avoid a distracting row in Europe. Third, in return for the happy couple pix and a host of ministerial cars, they have destroyed their credibility with many of their own voters, particularly in areas like the South West where they were seen as a repository for anti-Tory votes and in Northern cities where their council base had already started to crumble. Many Lib Dem members are already joining Labour. None of this is to suggest that the Lib Dems weren't right to enter a coalition deal. Indeed, they deserve some praise for being prepared to sacrifice their party for the sake of stable government. But anyone who thinks that they are the winners from the whole deal has been spending far too much time watching 24 hour news and reading the papers. This post has been picked up by Iain Dale. The huge rainbow has been removed from Sanctuary buildings, the headquarters of the reborn Department for Education, as civil servants work hard to remove any trace of Ed Balls’s old children’s department. Michael Gove, the new education secretary, has managed to keep his programme largely intact in this week’s coalition agreement with the Liberal Democrats. Now all he has to do is implement his plans for free schools, a pupil premium and more rigorous standards. Gove said in his first message to staff at his new Department that he wants it to refocus on supporting teaching and learning. The department may be slimmed down in the forthcoming Spending Review, but it also seems set to regain responsibility for a slimmed down curriculum from the soon-to-be-scrapped Qualifications and Curriculum Development Authority. There will be changes – sometimes more cosmetic than real – to suggest a tougher approach to school discipline and more rigorous exam standards. But the real challenges will come with free schools and the pupil premium. The coalition agreement says that academy expansion will come in response to parental demand. The reality is that it is likely to come through an extension of the existing academies programme, with failing schools given just a year to shape-up, and by allowing successful schools to acquire academy freedoms. Where there is parental demand – with a few high profile exceptions – it may often be about keeping open otherwise unsustainable small schools or opening minority faith schools. Gove’s real challenge will be in engendering a genuine enthusiasm for a policy seen as the most radical in his party’s manifesto, and he will need to re-establish a schools commissioner, a Blair innovation quietly abandoned by Balls. The pupil premium was an idea in both the Liberal and Conservative manifestos. In their manifesto, the Liberal Democrats costed the proposal at £2.5 billion. It may be less come the spending review. Schools currently receive most of their funding on a per-pupil basis. Local authorities create a ‘fair funding formula’ to take account of issues such as deprivation or pupils with special needs. While there is currently substantial extra money allocated to schools with significant numbers of disadvantaged pupils, there is no automatic additional per pupil sum available to all schools. The Liberal Democrat proposals could have provided an extra £2,400 per pupil on free school meals. Additionally, it is not clear how it would be distributed. At present, national government makes allowances in its dedicated schools grant for additional needs but the formula is determined locally. As part of the spending review, there could also be a look at the range of additional resources made available for deprivation and initiatives, and the pooling of these into a pupil premium. An important reason for the premium, in Conservative eyes, was its potential to incentivise good schools to take more disadvantaged students. The premium would provide extra resources for such pupils in the suburbs and shires, as well as inner city areas. However, unless the government can countenance a move towards a more open fair admissions policy – with more ability banding and lotteries to enable a wider range of pupils to apply to good schools unhindered by narrow catchment areas – it is hard to see how the premium could have this desirable impact. Many academies currently use such admissions criteria, but they are unpopular with middle class parents who find that living near a good school no longer guarantees a place there. But while implementing these policies is one thing, ensuring that they impact on standards is another. Labour had far too many targets, but those that achieved minimum standards were an unsung success, lifting thousands of schools in deprived areas. Without such floor targets and with less curriculum control, the new government will need to be sure that its levels of accountability provide the degree of demand and responsiveness necessary to lift standards further. Strong levers matter as much as radical policies. Gordon Brown has resigned with dignity. The progressive coalition was not to be. Soon we will have the details of the LibTory government deal. But for Labour, if it is to rebuild for the next election, now is a time for clever opposition not knee-jerk oppositionism. John Prescott may be relishing a fight. Those who find themselves leading the party in the months ahead need to worry more about the voters' real concerns. The biggest failure of the Brown years was the way in which some of his lieutenants undermined Labour's reform agenda, purely because it had been developed by Tony Blair. The result is that on education, particularly, the Tories adopted our policies and added a bit of extra radicalism to them. They were ably helped in the process of pretending otherwise by the decision to ditch an education department, sideline academies independence and focus on bureaucratic safeguarding procedures ahead of school reform. This approach not only undermined Labour's education record, it blunted Labour's continued radicalism on the NHS and its successes in fighting crime. It is vital that Labour regains the initiative for policy radicalism in opposition. That should mean a wholesale policy review to develop approaches for a more economically constrained age and for tomorrow's Britain, including political and democratic reform. It also means that there should be a clever approach to opposition, strategically opposing on issues where it is right to do so but regaining a reputation for forward thinking in the process and supporting the new government where it is right to do so. When it comes to selecting Labour's next leader, these must be foremost in the mind of the candidates and those of us who vote for them. We need a leader who can craft an approach to opposition and a plan for government that moves beyond New Labour but which doesn't ignore its lessons that allowed us to have 13 years in government. 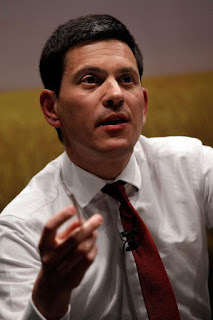 The person most likely to offer that balance is David Miliband. The new leader does start with a better base than might be expected. We are stronger in London and other cities in local government than for some time. We still have a healthy 258 MPs. We have much new blood and a stronger group of women and ethnic minority members. This is an opportunity for Labour to renew itself. But it is also a moment of real danger, when some may feel we can afford to relax into eighties comfort zones. Which direction we take will determine how long we are out of power this time. I understand why David Blunkett and John Reid believe that it is not in Labour's interests to enter a 'progressive coalition' with the Liberal Democrats and others. And it may be that such an arrangement does not emerge. However, there are several myths about such a government which should be scotched from the start. * It would not last as its majority would be precarious. In fact, there is no more reason why it would not last than there would be for a government with a small majority. With an understanding with other parties, there would need to be discussions before key votes. But that happens with contentious legislation and unruly backbenchers, as with the 2005 schools legislation. Given that there are 336 MPs who are not Tories, this need not be the case. With political reform and other issues, there would be every reason for minor parties to support the government. In fact, a Con-Lib Dem coalition would also be at risk to the vagaries of its backbenchers. * The Tories won the election. No they didn't. If they had done so under their cherished First Past the Post system, David Cameron would be in No 10 now. * The Liberal Democrats are being duplicitous for talking to Labour. This is pompous rot from the Tory press. In any coalition discussions, parties always talk to all potential partners. The voters gave us a hung parliament. They left the Lib Dems with the balance of power, not the Tories with an overall majority. The Lib Dems are sensibly keeping their options open. * A Lab-Lib Dem coalition would be less legitimate than a Tory minority government. Really? One has 52% of the votes, the other 36%. * The SNP would have to be part of any deal. No they wouldn't. With 13 Northern Irish MPs, there would be a total of 328 MPs with a 323 winning post. In addition, Plaid Cymru have three seats and the Greens one. * The markets are reacting terribly to all this. Yesterday we were promised a stock market crash, and there was a huge surge because of Europe. Today, there was the inevitable correction but Sterling has risen against the Euro. * It is a betrayal of the manifesto not to have a referendum on AV. Since the referendum was intended as a half-way house towards AV and it is also a half-way house towards STV, it is hard to sustain this argument unless you are a died-in-the-wool FPTPer. But it would be sensible to put both AV and a more proportional alternative to a referendum. The Tories' obsession with party interest looked like it trumped their supposed concern for the national interest. Their unwillingness to cede any ground on electoral reform until tonight's grudging concession on the Alternative Vote suggested that their shrill concerns about the economy amount to nought. Instead they assumed that the Liberal Democrats would be bullied into doing a deal on their terms, where Cameron failed to win over sufficient voters through such an approach. Now they know otherwise, and their offer may be too little too late. Gordon Brown's brave decision to stand down as leader is right both for the Labour Party and the country. It offers a chance of an alternative government. As I said here on Friday, the 320 votes that it would generally command (including 5 Northern Ireland MPs) means that it would only require the support of one of the DUP, SNP or PC to have a Commons majority given the absence of Sinn Fein and the neutrality of the Speaker. It is important, however, that any new Government has a clear but minimalist agenda, which reflects the best of both parties' policies. It should certainly prioritise economic stability, with a clear timetable for the savings needed, and political reform, with the Additional Member System for Westminster elections a sensible compromise for a referendum. Labour's NHS guarantees should not be traded, and there must be a rigorous approach to welfare reform. On education, the pupil premium in education is a good idea, but it must be funded, and there should be renewed enthusiasm for academies. However, higher tuition fees for universities will be necessary, despite the Lib Dems misleading pitch to student voters. Where possible, investment in new schools and high-speed railways should continue. Equally, given Labour's losses in the South last week, it is vital that nothing is done to increase income taxes further: there are alternatives like VAT which hit luxuries but not food or children's clothing. A new government may wish to drop ID cards (though as a non-driver, I'd quite like one) but must be wary of losing traditional Labour support on crime or immigration. A new outward-looking and forward-looking party leader like David Miliband has the chance to revive Labour's fortunes. It is vital that Labour does not choose a leader who has all Brown's faults but none of his virtues. And Gordon had his strengths, particularly on the economy; moreover our results last week were not as bad as many feared, particularly in local government. But equally there is no doubt that his leadership cost us a lot of seats in the South and South West. A new leader with a less statist approach to public services and a more open approach to the public has the chance to reconnect with those voters. Today's changes offer an opportunity for genuine new politics, even though the odds may still be on a Tory-Lib Dem arrangement. Whether the opportunity succeeds will depend as much on whether the Tories offer a real vote on PR as it will on the ability of Labour to agree the right deal and retain the support of smaller parties through very tough decisions. Liam Fox on the Today programme this morning suggested that electoral reform was some sort of fringe issue alien to the great British public. Unlike, presumably, the Tories' plans to gerrymander the constituencies in England to embed a permanent Tory majority of seats. Since Labour and the Lib Dems favoured at least a referendum on electoral reform, and most of the smaller parties support it, this means that 60% of voters backed parties supportive of electoral reform with a voting system where everyone's vote counts. And 36% backed a party in favour of gerrymandering the existing constituencies. Nick Clegg should remember that in his discussions with David Cameron, and settle for nothing less than an early referendum on the issue. I got some things right when I put on a few pre-election bets with Paddy Power. So I shall collect on Labour winning 251-300 seats at 5/2 and on Labour in Tooting at 11/8 and Harrow West at 4/7 as well as the Greens in Brighton and Lib Dems in Somerton and Frome. But my optimism in some other Labour seats and my expectations of 70-plus Lib Dem seats proved misplaced. Yet the results of the election - still coming in- are fascinating for their variety. I think there are some early lessons. The biggest one is for David Cameron. His failure to win what should have been a relatively easy victory is not just about strong local opponents: it is as much about the incoherence of a strategy that started presenting itself as Blairism-ultra and morphed into neo-Thatcherist talk about austerity. At the same time, his lieutenants presented potentially attractive policies like 'free schools' without proper costing and vague notions about delivery. If he was confused, the voters were more so. Had he really been studying the Blair election-winning blueprint properly, he would have recognised that coherence, fiscal discipline and consistency were its hallmarks from 1994 to 1997. And there are five other observations after last night. 1. Clearly, the returning officers in some areas need to get their act together. If someone has arrived at the polling station in good time, they should be allowed to vote, even if it means locking them into the station until polling is finished. Denying people a vote in such circumstances is outrageous. 2. Labour needs to study certain seats where its vote held up, including not just the obvious places like Birmingham Edgbaston, Westminster North or Islington South, but also places like Mitcham and Morden, where Siobhain McDonagh has turned a seat only won from the Tories in 1997 into a rock-solid Labour seat. The swing to the Tories there was a mere 0.4%. This suggests that a stronger campaign elsewhere could have stemmed more losses. 3. The Liberal Democrats would probably have held more of their seats and gained others had Nick Clegg not been so sanctimonious about tactical voting. In places like Wells and Somerton and Frome it was tactical voting that won it for the Lib Dems. Equally, had they not pretended they could win in some other Lab-Con marginal seats the Tories would have been in a worse position. Clegg would be in a stronger bargaining position in such circumstances. 4. It was a bad night for independents. I must confess this was a bit of a surprise. I have no time for Esther Rantzen but I expected her to do rather better than she did. Perhaps what she lacked and Martin Bell did not (though you wouldn't know it) is that Bell won with the help of some very efficient party organisers loaned to him for the occasion. 5. Northern Ireland rejected David Cameron. Sylvia Hermon won handsomely. Sir Reg Empey failed to win in his own constituency. Peter Robinson aside, the DUP held their seats, and many are angry about Cameron's batty decision to big up the official Unionists. The SDLP and Hermon vote with Labour. And the Alliance Party which took Robinson's seat are Lib-Dem allies. It is also worth remembering that Sinn Fein's potty refusal to take their four seats means that the winning post is actually 324. If Clegg can't do a deal on electoral reform with Cameron, Labour could govern with Lib Dem and NI party support. What happens now remains to be seen. I've always thought Clegg would prefer to do a deal with the Tories before he dealt with Labour, even though the outgoing Prime Minister has the right to try to form a government first when the opposition has failed to win an overall majority. Cameron can only get it if he offers a referendum on electoral reform - I suspect he might do so, while allowing his MPs to campaign against as with Wilson's EEC referendum in the seventies. But the arithmetic still presents an alternative that could have a working majority. When the Tory leader of Kent County Council, Paul Carter, warned that the Conservatives' free schools policy threatened funding for local authorities and other schools, he had a rare success highlighting a hidden truth behind the parties' education policies: they are making promises in today's election that they can't really keep. Free schools are affected by a black hole in Tory school funding. The Liberal Democrats can't guarantee lower class sizes, and Labour has published pupils' and parents' guarantees with no real means of enforcement. Michael Gove tried to bat off suggestions on Radio 4 last week that there was no money to fund his flagship policy. But while the Conservatives have said that they would raid Labour's school building fund to pay for capital costs for parent-led schools, they have not said how they would cover extra day-to-day costs. Instead, as Mr Carter rightly recognised, they have promised to top-slice local authority budgets to fund pupils at the new schools. However, there would be costs in maintaining surplus school places to increase choice and in continuing to fund local authority schools functions, such as admissions, school buses, truancy wardens and special needs. Gove is likely to need £1bn a year for revenue costs extra if his policy is to succeed. All three parties propose some form of pupil premium which would give schools extra money for pupils from poorer backgrounds. At present, many schools get more money in deprived areas, but good schools in more affluent areas get little extra to attract poorer pupils. The pupil premium would overcome this. However, as it will effectively provide new subsidies to schools in the suburbs and shires, the Liberal Democrats have said it will cost £2.5bn a year, and they have suggested ways they might fund it. The Tories have given no details of how they would fund their premium. With the free schools shortfall this means there is likely to be a £3.5bn black hole that Gove says will come from cuts in areas not part of the schools budgets. While some may come from axing quangos like the curriculum authority, it could also mean cuts in youth services, education maintenance allowances for sixth formers, the teachers' pension fund and teacher training budgets if there is to be no new money for the education department. But the other two parties have their own credibility gaps too. Nick Clegg, the Liberal Democrat leader, insists that his party will cut class sizes and introduce one-to-one tuition for struggling pupils. He has described it as one of his top priorities. What he really means is that his £2.5bn pupil premium, once it is distributed to schools, could be used for these purposes. Or it might not: it may instead be used to prevent cuts in basic staff budgets at a time of increasing austerity.As the Liberal Democrats have an aversion to central prescription, they have no idea what the money will actually be used for. The Scottish Nationalist Party promised to cut infant class sizes to 18 in 2007. As good localists, they gave the money to local authorities with few strings. The result was that councils spent the money elsewhere, teacher numbers fell and there was no improvement in infant class sizes. The minister responsible was demoted. Labour has suffered from the opposite problem. It has adopted a more centralised approach to schools of which the pupil and parent guarantees are its flagship manifesto commitment. Intended to support parent power, the guarantees on everything from pupil detention rules to one-to-one teaching were included in Labour's last schools bill but ran out of time in the Lords once the election was called. But the schools department had already issued an 80-page blueprint, the detail of which had spread alarm among head teachers who have grown used to growing autonomy. In reality, the guarantees are more likely to frustrate parents as there is little indication of how any of their new commitments can be enforced: they are unlikely to stand up in court. David Cameron on Marr this morning was a taste of things to come, if the polls are right. When asked where he would find the £50 billion of cuts that the respected Institute of Fiscal Studies has said that he must find, he tells us that he and his cabinet will take pay cuts, saving a few thousand quid a year. When honesty is called for - and at least Gordon Brown has promised to halve the deficit in a clear timescale, even if that too may not be enough - all we seem to get from the man who could be PM is populist spin. Then the ex-spin doctor tells us that he will be ignoring the 24-hour news cycle to pursue 'quiet effectiveness' if he gets to No 10 as he rolls up his sleeves. Even though his special advisers and spin doctors will be concentrated in his Downing Street bunker to a greater extent than ever. Expect plenty of flying pigs too.